“I’m late, I’m late!” so says the rabbit in Lewis Carroll’s Alice. But this bunny has plenty of time to frolic amongst the toadstools and the fairy-lights. And what’s that in the background? I think there’s a party going on in the forest today! 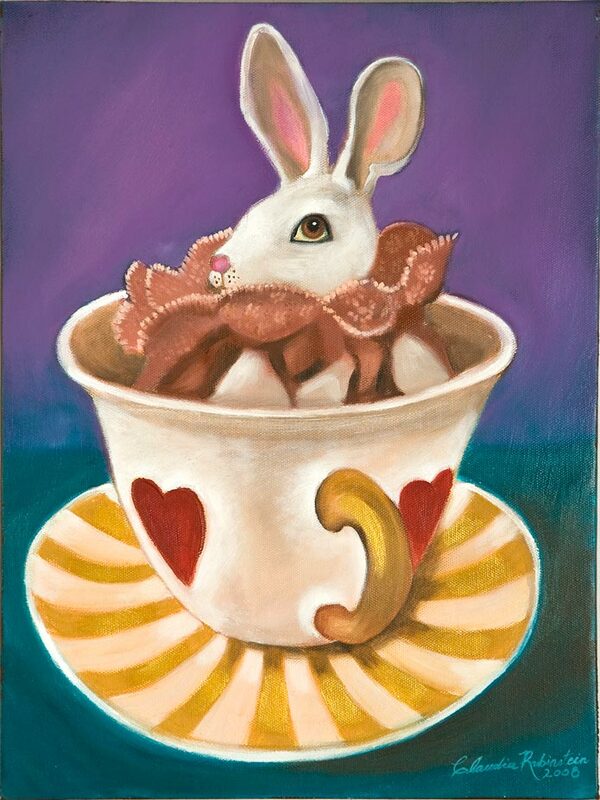 Miss Alice was going to have tea with her dear friend the rabbit, but before she could fill her cup she discovered another bunny had other ideas. Looks like she’ll have to find another teacup! Listen up, listen up! It’s a fairy parade, and who’s marching up front? Why, it’s Mr. Ladybird! 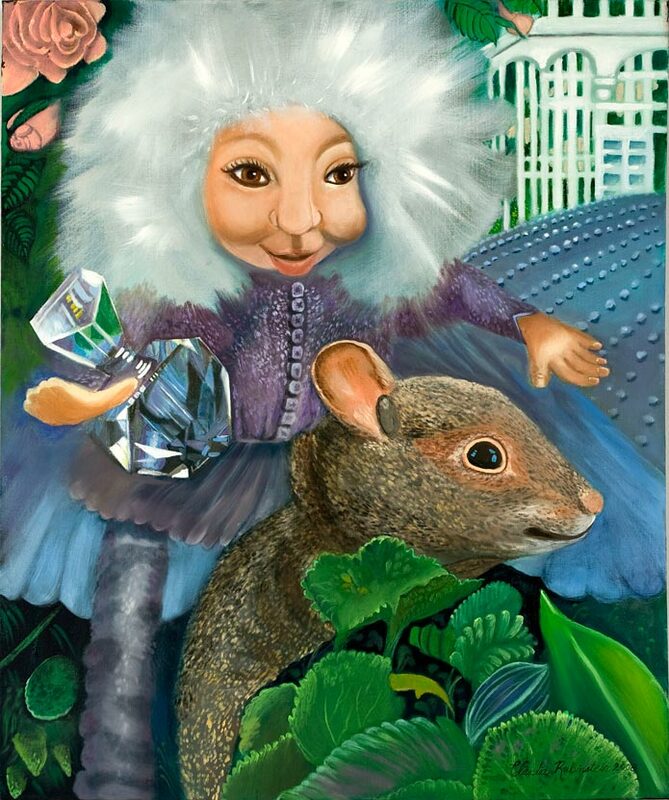 This is one in a series of paintings on the fairy host and their garden romps, a perfect gift for a child (or an adult who keeps the child inside them wide awake and full of wonder). Keep an eye on the playful garden elf; with his crystal flask of magic potion and his trusty squirrel steed there’s no knowing what mischief he could make! Think twice about giving this to a cheeky child – you might give them ideas! 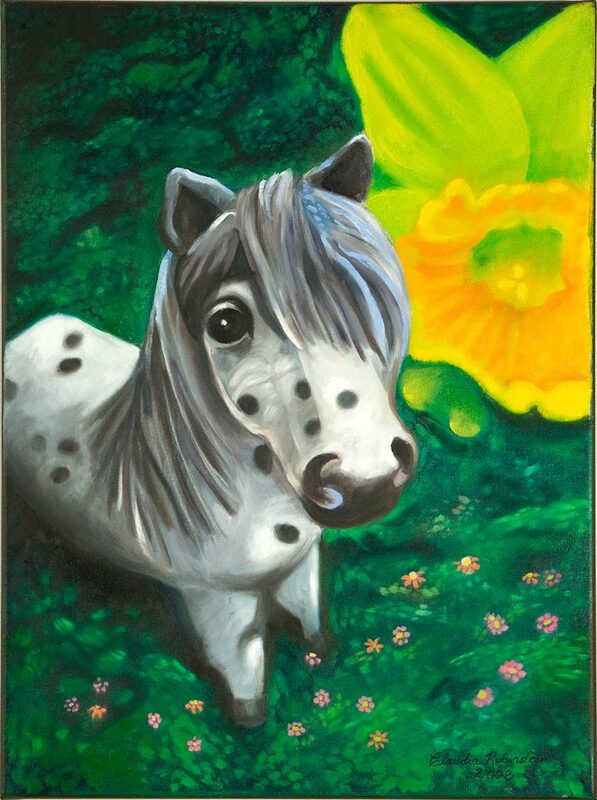 This sweet fairy pony is tiny enough to fit in the palm of your hand, and so shy she spends most of her time hiding out in the daffodil bed. If you sit very quietly, though, you can coax her out with sugar crystals. Win her trust and she’ll be yours forever. Goodness gracious – a rabbit in a teacup! Lucky there are plenty to spare, because he looks quite comfortable in there. 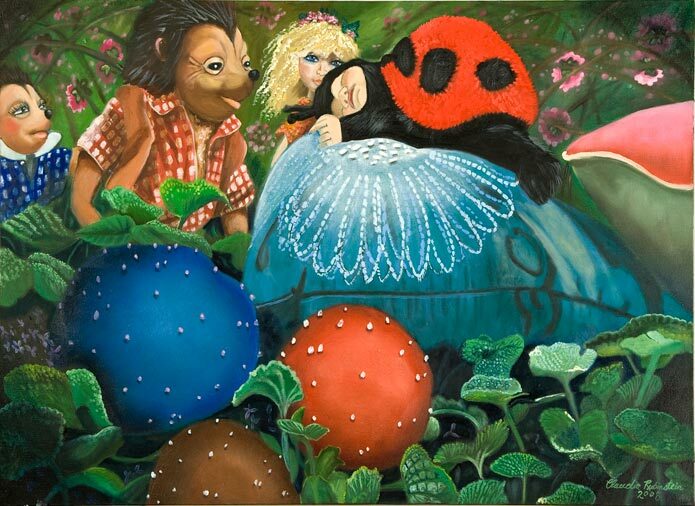 Uh-oh, little baby ladybird has had a long day in the fairy court. She’s fallen asleep on the queen’s favorite blue pillow! Never mind – Mr. Hedgehog is here to take her home and tuck her into bed. It’s hard work playing in the forest all day with the fairies! The afternoon is drawing in and it’s time for high tea in the fairy court. Miss Alice is going to pour the milk – watch out, though, Mr. Hedgehog looks like he wants to drink it all!